Eurocom Corporation (www.eurocom.com), the leading mobile technology developer launches the AMD HD6970M MXM 3.0b graphics module for embedded systems use. MXM Modules are available from Eurocom's MXM Group. The AMD HD6970M graphics MXM 3.0b module is ideal for high performance embedded applications that require the absolute best in terms of graphical performance and processing capabilities such as such as satellite imaging, mapping, surveillance, military, security, medical imaging, digital signage, gaming, gambling, image recognition and robotics . Uses include SFF (Small Form-Factor) computers, and notebook designs. The industry standard MXM 3.0b specification for graphics subsystems allows for improved cooling capability, reduced power and height, enabling engineers to create smaller, more efficient embedded systems, reduce development time and costs and to introduce new designs faster to market. 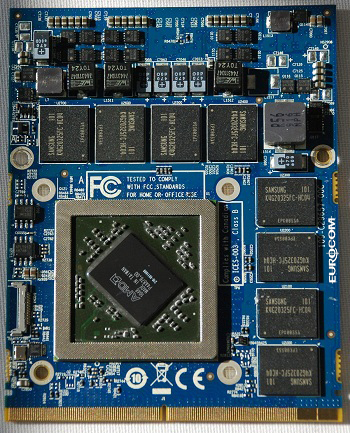 The EUROCOM HD6970M MXM 3.0b graphics module is currently the highest performance GPU for embedded designs available on the market. The HD6970M graphics processor unit also supports 3D stereoscopic and BD-3D technologies with hardware MVC decode support. With the addition of the new security processor feature, DRM support can be off loaded from the CPU to GPU. HD6970M supports DX 11 with Shader Model 5.0, PCI E Revision 2.0, DisplayPort 1.2, and integrated HDMI 1.4a technologies. The unified Video Decoder 3 enables support for dual stream decode of high definition contents, along with the decode support of H.264 and VC-1, and entropy decode support of MPEG-2 HD and MPEG-4 part 2 (DivX and xVid). 3DMark Vantage, 3D Mark 11, 3DMark 06, and Unigine Heaven 2.1. Eurocom is a leading developer of mobile computer technology. The company has produced many firsts and continues to engineer VGA solutions that inspire and enable individuals and companies to reach great possibilities. For more information on programs, such as the "Trade in Program", "Education Program", "Factory Outlet" and "Upgrade Center" or to customize a machine, visit Eurocom.com. ©2011 Eurocom Corporation all rights reserved. Eurocom and the ‘Eurocom’ logo are trademarks of Eurocom Corporation. All other trademarks are property of their respective owners.